A prologue to the Second World War, the Battle of Khalkhin Gol (Nomonhan) took place during the summer of 1939 between the Soviet Union and the Empire of Japan. The battle highlighted the use of massed armor to spearhead an offensive campaign. These tactics were replicated in Europe during the infamous German “blitzkrieg”. After commanding Soviet forces at Khalkhin Gol, Georgy Zhukov would later apply these tactics against the Germans during the Battle of Stalingrad, turning the course of the war in 1943. The Battle of Khalkhin Gol Campaign Module allows players to reenact this historic battle using the Micro Brick Battle game system. 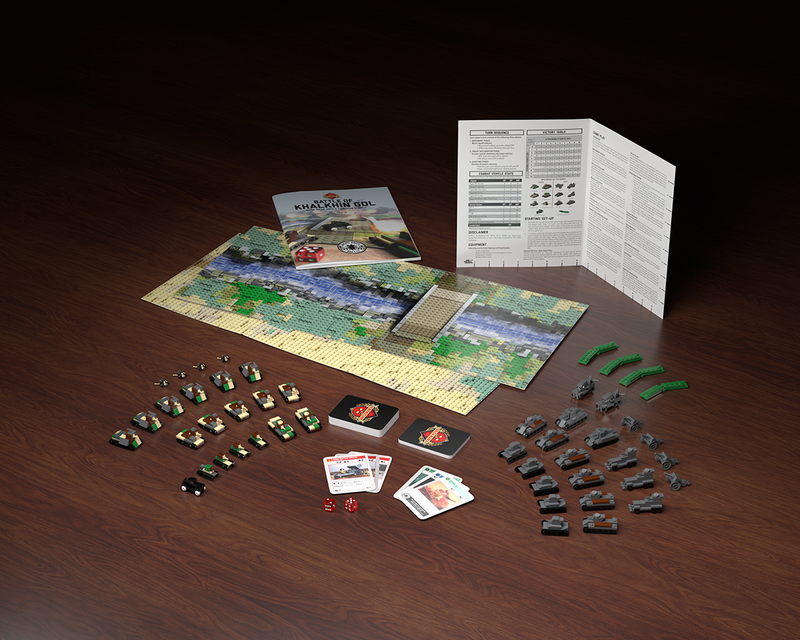 The module presents three scenarios that are played using a custom-designed play map that includes several prominent features of the battlefield. This module battle pack includes authentic LEGO parts with full-color step-by-step instructions for building each combat vehicle used in the scenarios, as well as Bricks of War cards for each vehicle, plus several new effect cards to arm commanders with new tools to defeat the enemy. This complete battle pack provides 975 genuine new-condition LEGO parts for the construction of the 45 armored vehicles, field guns, howitzers, and one small black sedan. These represent the wide array of vehicles seen on the battlefield during the summer of 1939 and are designed to be historically accurate in size, color, and armament.